Surveillance image of the suspect in the mugging of a woman in Uniondale. UNIONDALE, Long Island (WABC) -- Police on Long Island are searching for the suspect who robbed an elderly woman in a nursing home parking lot. 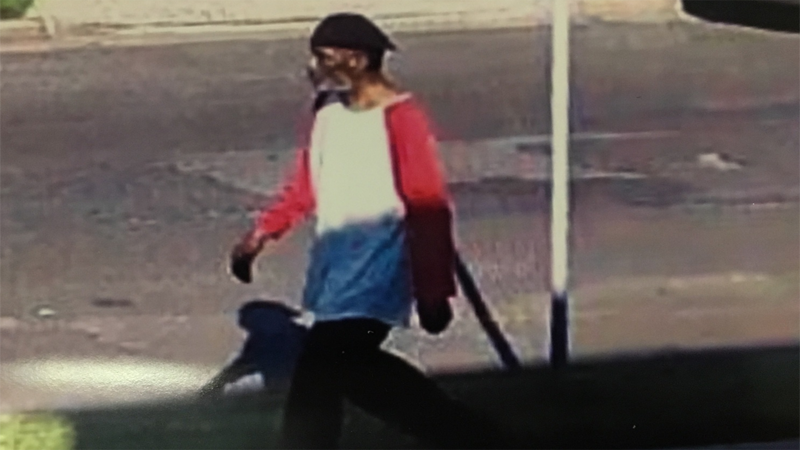 The 78-year-old woman was visiting a family member on June 22 at Town House Center for Rehabilitation and Nursing in Uniondale. The victim was approached in the parking lot by a man who demanded money and forcibly removed her pocketbook, police said. The victim fell to the ground but was not injured. The suspect fled north on foot with the pocketbook and its contents. The suspect is described as a male black, 40-45 years old, wearing a black Kangol hat, red and white shirt, dark colored pants and shoes. Detectives ask anyone with information regarding this crime to contact Crime Stoppers at 1-800-244-TIPS.